Toronto Stock Exchange (TSX, formerly TSE) is the largest stock exchange in Canada, the third largest in North America and the seventh largest in the world by market capitalization. Based in Canada’s largest city, Toronto, it is owned by and operated as a subsidiary of the TMX Group for the trading of senior equities. A broad range of businesses from Canada, the United States, Europe, and other countries are represented on the exchange. In addition to conventional securities, the exchange lists various exchange-traded funds, split share corporations, income trustsand investment funds. The Toronto Stock Exchange is the leader in the mining and oil & gas sector; more mining and oil & gas companies are listed on Toronto Stock Exchange than any other exchange in the world. The Toronto Stock Exchange likely descended from the Association of Brokers, a group formed by Toronto businessmen on July 26, 1852. No official records of the group’s transactions have survived. On October 25, 1861, twenty-four men gathered at the Masonic Hall to officially create the Toronto Stock Exchange. The exchange was formally incorporated by an act of the Legislative Assembly of Ontario in 1878. The TSX grew continuously in size and in shares traded, save for a three month period in 1914 when the exchange was shut down for fear of financial panic due to World War I. 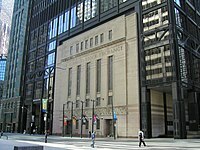 In 1934, the Toronto Stock Exchange merged with its key competitor the Standard Stock and Mining Exchange. The merged markets chose to keep the name Toronto Stock Exchange. In 1977, the TSX introduced CATS (Computer Assisted Trading System), an automated trading system that started to be used for the quotation of less liquid equities. On April 23, 1997, the TSX’s trading floor closed, making it the second-largest stock exchange in North America to choose a floorless, electronic (or virtual trading) environment. The old TSX building would later become the Design Exchange a museum and education centre. In 1999, the Toronto Stock Exchange announced the appointment of Barbara G. Stymiest to the position of President & Chief Executive Officer. Former logo of the TSE. Through a realignment plan, Toronto Stock Exchange became Canada’s sole exchange for the trading of senior equities. The Bourse de Montréal/Montreal Exchange assumed responsibility for the trading of derivatives and the Vancouver Stock Exchange and Alberta Stock Exchange merged to form the Canadian Venture Exchange (CDNX) handling trading in junior equities. 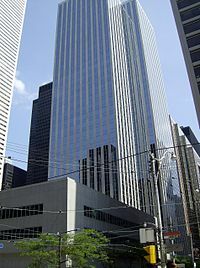 The Canadian Dealing Network, Winnipeg Stock Exchange, and equities portion of the Montreal Exchange later merged with CDNX. Former logo of the TSX. In 2000, the Toronto Stock Exchange became a for-profit company and in 2001 its acronym was changed to TSX. In 2001, the Toronto Stock Exchange acquired the Canadian Venture Exchange, which was renamed the TSX Venture Exchange in 2002; This resulted in the creation of a parent to the TSX, the TSX Group. This ended 123 years of the usage of TSE as a Canadian Stock Exchange. On May 11, 2007, the S&P/TSX Composite, the main index of the Toronto Stock Exchange, traded above the 14,000 point level for the first time ever. On February 9, 2011, the London Stock Exchange announced that they had agreed to merge with the TMX Group, Toronto Stock Exchange’s parent, hoping to create a combined entity with a market capitalization of $5.9 trillion (£3.7 trillion). Xavier Rolet, who currently is CEO of the LSE Group, would head the new enlarged company, while TMX Chief Executive Thomas Kloet would become the new firm president. Based on data from December 30, 2010 the new stock exchange would be the second largest in the world with a market cap 48% greater than the Nasdaq. 8 of the 15 board members of the combined entity will be appointed by LSE, 7/15 by TMX. The provisional name for the combined group would be LTMX Group plc. About two weeks after Maple Group launched a competing bid the LSEG-TMX deal was terminated after failing to receive the minimum 67% voter approval from shareholders of TMX Group. The rejection came amidst new concerns raised by bank of Canada governor Mark Carneyregarding foreign control of clearing systems and opposition to the deal by Ontario’s finance minister. On June 13, 2011, a rival, and hostile bid from the Maple Group of Canadian interests, was unveiled. A cash and stock bid of $3.7 billion CAD, in hopes of blocking the LSE Group’s takeover of TMX. The group is composed of the leading banks and financial institutions of Canada. The exchange has a normal trading session from 09:30am to 04:00pm ET and a post-market session from 04:15pm to 05:00pm ET on all days of the week except Saturdays, Sundays and holidays declared by the Exchange in advance. “Moscow Exchange MICEX-RTS” (Russian: ОАО Московская Биржа ММВБ-РТС) is the largest stock exchange in Russia, located inMoscow, trading equities, bonds, derivatives and currencies. It was officially established on 19 December 2011 through the merger of the two largest Moscow-based stock exchanges, the Moscow Interbank Currency Exchange and the Russian Trading System. 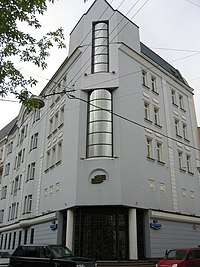 Both organisations were formed in the 1990s and for two decades were the leading exchanges in Russia, with the MICEX Index and the RTS Index being among the world’s top stock indices. The merger created a single entity that is expected to become a leading stock exchange globally for trading across asset classes and to advance Russia’s plans to turn Moscow into an international financial centre. The goals of the merger include the optimisation of the Russian stock market, the reduction of the number of organisations with overlapping functions, the creation of a single platform for issuers, traders and investors, the reduction of transaction costs, and easier trading. Ahead of the merger, the capitalisation of the MICEX-RTS company was estimated the equivalent of $4.5 billion. The exchange is targeting an IPO in 2013, in preparation of which the exchange took on the legal form of open joint-stock company on 19 December 2011. In 2012 the company plans to launch the trading in T+N and to create a single trading account for the spot and derivatives markets. Russia’s main depositories, the National Settlement Depository and the Depository Clearing Company, are also expected to merge in 2012, and the MICEX and RTS Indices are expected to be unified in the same year. The full merger of the organisational structure is not yet completed. Problems in merging the infrastructure resulted in computer error in trades, something that had not happened on the merged exchanges for a decade: on the first day of trades, there was a short period of computer glitches when the clearing system malfunctioned, which resulted in registering multiple unsanctioned deals, with some traders suffering losses. The united exchange went through a rebranding, with the new brand identity was unveiled in early July 2012.